In today’s economy, finishing college without a prearranged job prospect can be quite intimidating and unsettling. For many graduates, the first step in job hunting is updating their resume – as it should be. But nowadays, job seekers must also make sure that their digital footprint is perfectly aligned with their job seeking efforts and that it showcases their skills and abilities to the maximum. 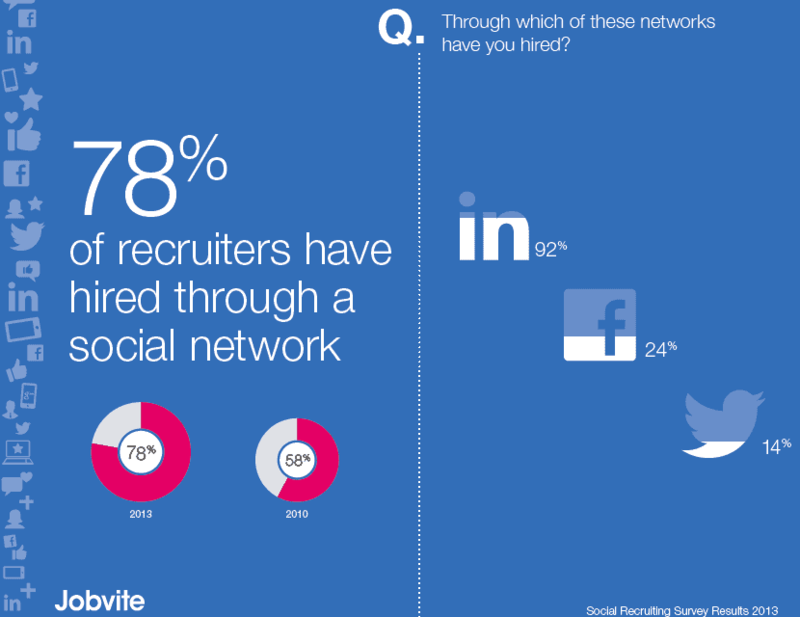 Survey done by Jobvite in 2013, a social recruiting and applicant tracking software seller, on a sample of 1600 recruiting and human resources professionals, shows that 94% of recruiters use or plan to use social media in their recruitment efforts and that 78% of recruiters have already found a perfect candidate through social media. This report indicates the impact of candidate’s digital presence on his or hers job seeking efforts. In digital era, even though resume, cover letter and references are still mostly required by the recruiting companies, if the candidate does not pass a digital check, he or she will not be invited to an in-person interview. Not only that, recruiters now openly approach those they deem to be quality candidates on the social media. This goes to the extent that recruiters report that their highest-rated candidates come from company’s and employee’s network – referrals, social networks and corporate career site. 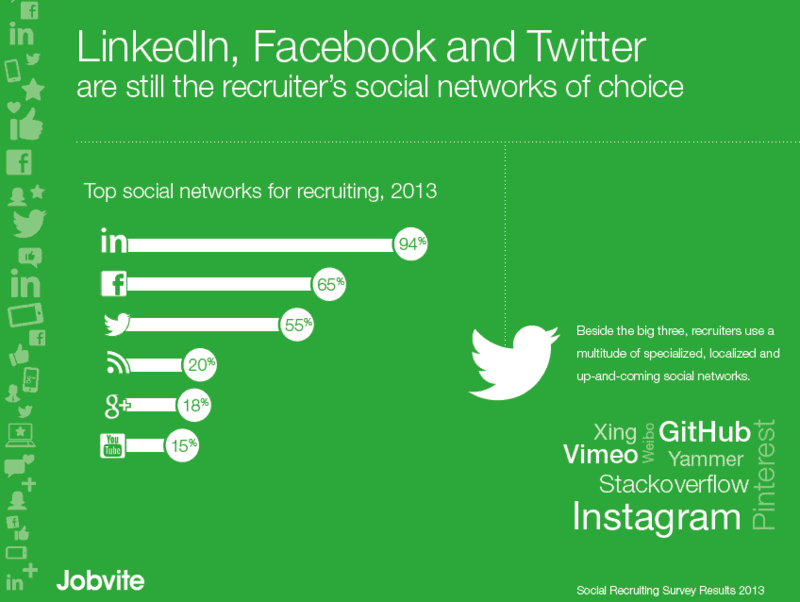 Jobvite reports that the top social network for recruiting in 2013 is LinkedIn with 92% of all candidates hired through social networks, with Facebook (24%) and Twitter (14%) coming second and third. LinkedIn, as world’s number one professional social network, with 300 million members in over 200 countries, is the go-to site for information about candidate’s professional experience, length of professional tenure and specific hard skills. On the other hand, sites like Facebook, Twitter, blogs and Google+ are most often used to determine cultural fit and professional expertise through graphic and video material, blog posts and other publications. In light of these findings, it is true that students and recent graduates alike face a difficult task of making presentable, compelling and competitive social media presence that will somehow distinguish them from hordes of other candidates competing for the same job. But there are ways to manage that even if one has none to limited work experience. 1. Facebook – With Facebook being most popular social network and having on average 802 million daily active users, it is highly probable that you already have a profile. Take care to make it presentable even to the critical eye of professional recruiter by cleaning out compromising pictures, posts and videos. 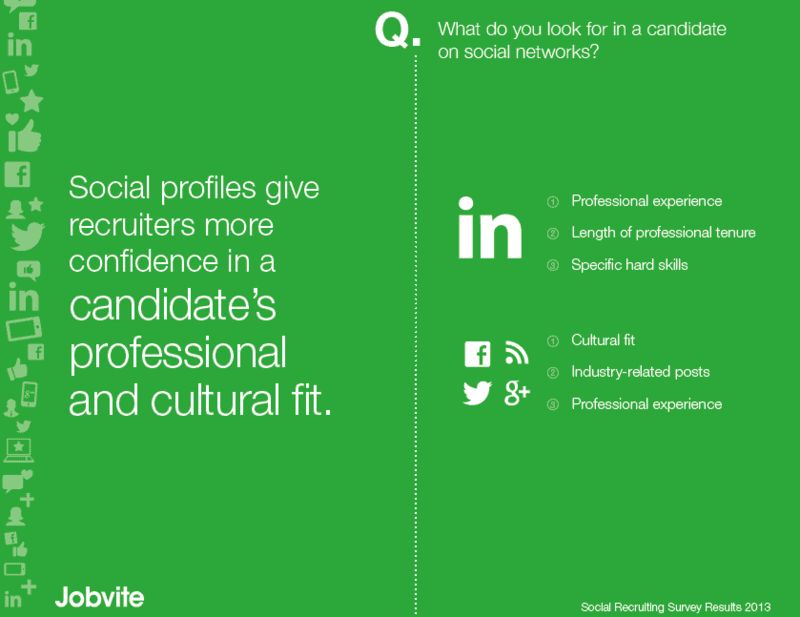 Recruiters use Facebook to determine cultural fit and character of a candidate. 2. Twitter – Use Twitter to follow news and topics, ask and get answers, spread a word about your work, and most importantly, build your network. Pay attention to follow people and organizations of influence in your interest sphere – that way you will remain up to date with relevant news and information. What recruiters will look for is the scope of your network and shown interest and expertise in industry related topics. 3. about.me – A great way to take control of one’ digital presence is to have a landing page – a page that will appear first in search results and lead to all of your other profiles. I would recommend about.me, a free service that lets you create a “digital business card” with short bio, picture and links to all your social media profiles. With about.me you can use your words and picture to show what makes you unique (even if you have zero working experience) and build a network of people you find interesting. Concise and representable landing page will be an excellent starting point for recruiters to find out more about your personality and professional experience. 4. LinkedIn – Don’t be discouraged by elaborate and detailed profiles of seasoned professionals. Even if you have limited working experience, you can use LinkedIn to showcase you skills and abilities and begin building your professional network. You can display taken college classes, campus and/or civil volunteering engagements, summer internships, test scores and attended conferences and seminars. You can also ask a professor, organization you have volunteered for or classmate to write you a brief recommendation. Just make sure you have a professional looking photo. While perusing your LinkedIn profile, recruiters will pay attention to your professional and volunteering experiences, recommendations, hard skills and affiliation with relevant organizations. 5. Blog – You can maintain a personal blog to showcase your expertise and opinions on certain subjects, your interests and your personality. Original way to do that is to get your own personal domain name, for example www.kelly.me, for your blog. Just make sure to update it regularly and to watch out for grammar and typing errors as that is something recruiters feel most strongly about – they trigger negative reactions among recruiters over 60% of the time. Recruiters look at candidate’s blog to find out about topics he/she is most passionate about, professional expertise, cultural fit and writing style. What about your experience? What social media sites have you found most useful for creating and maintaining compelling digital presence? This is the first post in Personal Branding for Students and Graduates Campaign. Stay tuned for more!